Images of Seattle, San Francisco, Montreal, Berkeley, Miami and Fayetteville sourced from iPhones, sketchbooks, and Flickr users. Design by Karen Johnson. 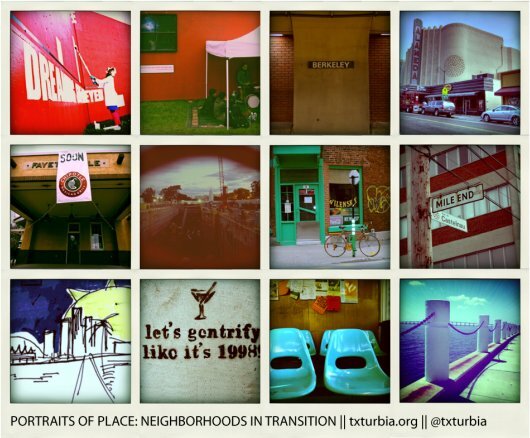 For our Portraits of Place series, we here at TXT-Urbia have decided to get big picture. And since Geoffrey West is already tackling the whole solving-of-the-world’s-problems-through-physics-thing, we’ve opted to analyze the city with a less rigid approach. Beginning this month, our team of contributors will explore city neighborhoods as transitory spaces. From Haight-Ashbury in San Francisco to Pittsburgh’s South Side, we will use words, images, video and audio to highlight the changing physical, social and economic environments of the urban ‘hood. Why have we chosen to embark on this project? For the past several months, TXT-Urbia has been asking a simple question: How do people understand city theory in the digital age? Our method for answering this question: Set up a quick and dirty blog, select and read four books that emphasize different ways of understanding the city (The Death and Life of Great American Cities, All that is Solid Melts into Air, Times Square Red/Times Square Blue and The Rise of the Creative Class), collaboratively analyze these texts using everything from e-mail to Skype, and finally, apply the readings to our everyday lives through a series of blog posts and tweets. Being net natives, we’re also exploring how the novice urban voice is received online. We seek to read with an awareness of today’s 24/7 distractions and preoccupations—all while embracing social and online technology (How do we understand classic urban texts in a virtual context? 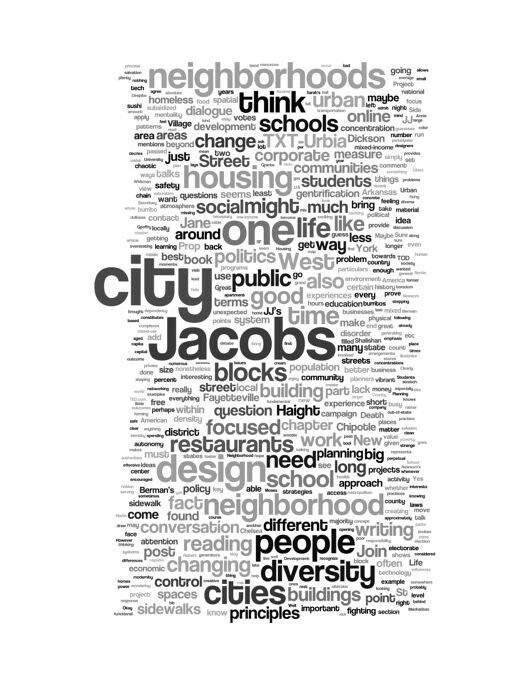 What are the new ways of reading and writing about cities? Is TXT-Urbia merely a book club for the Facebook era?). No, we don’t have all the answers. And, yes, we’re still figuring out what we’re doing and why we’re doing it. However, from design, to political economy, to innovation, our goal is to connect these subjects and themes with the places in which we live and know about. Along the way, we also hope to enlighten and educate ourselves in our exploration of neighborhoods in transition. Above, a graphic representation of our posts on Txt-urbia. As we explore the neighborhood as a space of transition, we encourage you to chime in with feedback, comments, questions or concerns. Who knows? maybe we’ll inspire a few of you to read along with us and ask a few questions of your own.